www.racerxonline.com The annual “fall supercross in Las Vegas that wants to be anything but a supercross” took place this past weekend. 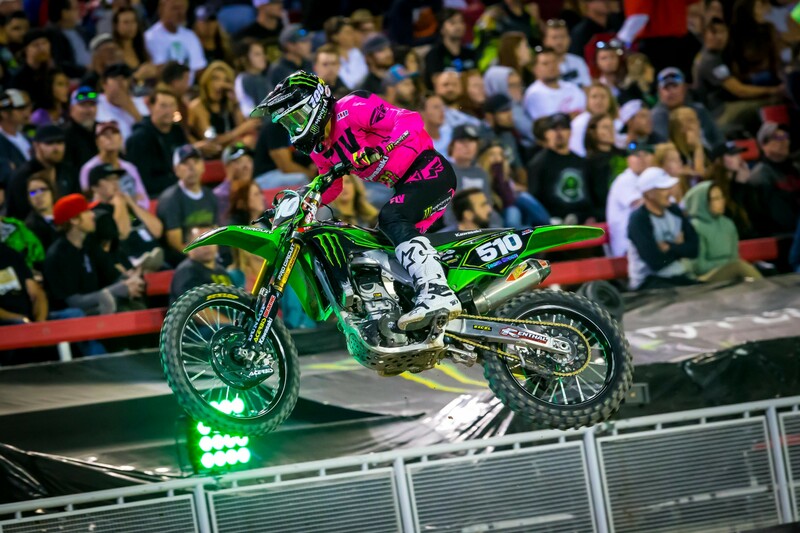 The folks at Feld Motor Sports do a good job with changing things up at the Monster Energy Cup, but as I wrote last week, I’m not sure if everything is working at this event. 1.) Marvin Musquin rode amazing and won one million dollars, only the 2nd rider in history to do so. 2.) Jason Anderson rode very well to go 2-2-2. 3.) Dean Wilson continued his amazing comeback from a van in Anaheim to get third. 4.) Kristen Beat was the new pit reporter and did a good job on the TV broadcast. 5.) Jake Weimer was asking so many questions about superminis in the press box that he seemed like he might build one. 6.) I thought the Ricky Carmichael designed track was one of the better MEC tracks we’ve had. 7.) Jordon Smith got fifth overall! There, I think we’re set. So, it’s been a while now and perhaps a move closer to the start of the supercross season might be in order for this race. I know Musquin agreed with that when we spoke with him on the Pulpmx Show this past Monday night and many of the riders I spoke with thought that would be fine also. It would give the fans a little bit of a preview for what’s going to happen at Anaheim in a few weeks and wet the appetite for all the subplots in the upcoming season. Or maybe go back to an arena like how the race started. I know that would prohibit Monster Energy, the title sponsor, from doing some of the big demos it likes to do in the parking lot, but the MEC seems to now be (and this isn’t scientific by any means other than me talking to the riders and teams) something that’s becoming an obligation more than something fun and desirable to do. At one time when this race started in 1998, the purse was enough to get a lot of the riders jazzed up to head up to Vegas. Trust me, the amount of money in the purse was huge news and got the riders very excited. To win was 100K in 1998, when Jeremy McGrath was getting 50K for a supercross win and roughly $350K a season base salary from Yamaha, well that was huge money. And because the purse hasn’t been raised in 19 years at this race (think about that) 100K now to an elite rider is just another normal supercross win bonus. The top rider’s salaries start at one million and go as high as two or three million from an OEM. Last place in the MEC main event is about the same as last place in a 450SX main event. It’s 12K to win a 450SX main event so obviously that jump from 12K to 100K is huge, but it’s not as big once you take into effect what an elite dude gets as a bonus from all his sponsors. I think part of the reason this race feels like an obligation to the riders has something to do with their bonuses and salaries outgrowing the draw of the purse. However, there is the one-million-dollar bonus for the rider that sweeps all three main events. 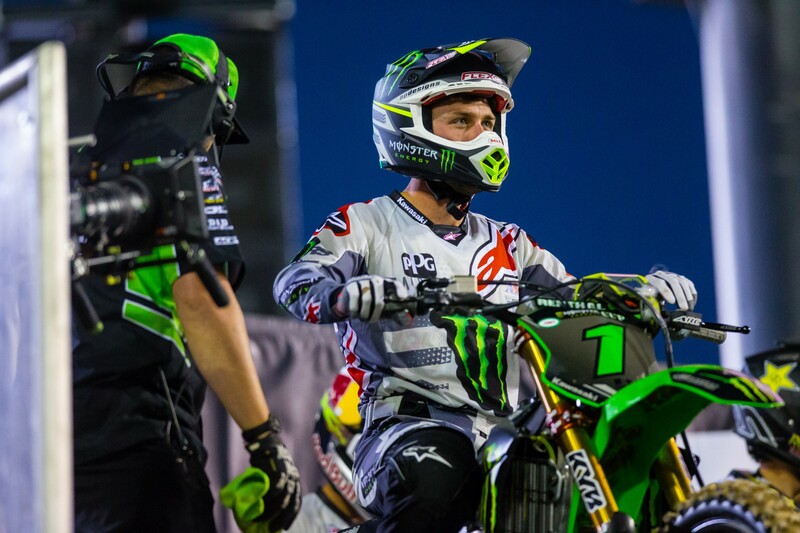 It had been collected one time before, by Ryan Villopoto who then complained about how it was either paid out after taxes or paid out in an annuity (but then again one time, when he won a Toyota truck, he said he was going to trade it in for a Ford. Ahhhh where have you gone RV?). Well, as I said, this year Musquin took home the million with three picture-perfect rides. He grabbed two out of the three holeshots, led 28 out of 30 laps and hardly broke a sweat out there in winning the million. Musquin was awesome out there. I wonder if we’ll see an even better version of Marv in 2018 because of the new machine Red Bull KTM will unveil really soon. Musquin and teammate Broc Tickle, along with Rockstar Energy Husqvarna’s Jason Anderson, were all on bikes that had a much different shock placing than the older model which tells me the frames are quite different and the motor was also changed. This is actually one of the cool things about Monster Energy Cup—teams are allowed to go outside the regular production rules. The bike Marvin, Tickle, and Anderson rode at MEC is going to be their 2018.5 Factory Edition, and expect it to launch not long before Anaheim. Seeing as how good the last generation of FE machines were (it took Ryan Dungey to a new level in 2015), I wonder if the guys at KTM have gone next level with this machine. Time will tell I suppose. We asked Marv about the new bike on the Pulpmx Show and he dipped and dodged the question pretty well. KTM was also telling photographers at the race to beat it and not take photos of the bike up close. Uhhhh, have you seen the lenses these guys have? They could stand near the hot dog vendor in the stadium and still zoom right in on the new throttle body KTM had on the bikes. KTM does realize that long lenses exist, right? I was excited to see Tim Gajser show up at the MEC. Gajser’s expressed a strong interest in racing in the U.S. and I think we’ll see him one day soon. I just hope when that day comes he brings some stiffer suspension with him. Gajser used his MX set-up, just stiffened up for SX. This just in: it was way too soft. Yeah Ol’ Tim killed it in the corners and actually qualified well but you could see many close calls out there. Clipping jumps, over-jumping anything and Gajser was shot off side-to-side over and over. It was bad enough that Villopoto, who was up in the press box with us, said “Oh boy, he’s gonna have a big one” and this was in practice! And Tim had a big one in main event number one and that was it for him—he was done for the night. Word is the Honda guys bolted on some of Justin Brayton’s supercross stuff for him to try but he did a lap and a half and said he couldn’t ride with it. Which is understandable because of how it feels, but I’m guessing if he shows up for some supercrosses in 2018 (which I understand is the plan), it’ll be with standard supercross stuff. Gajser was good—too bad his bike set-up wasn’t. I was also excited to see Eli Tomac. He was expected to win the event or at worst battle with Musquin tooth and nail for the win and he did just that early in the first main. Then he high-sided in an ugly crash and he too called it a night. And other than him running a jersey with #3 on it when his bike had #1 on it, things were looking good until his hard crash. Luckily he seemed to be ok.
Justin Barcia was an exciting addition to the MEC. The man who has had factory supported bikes and salaries for probably the last 10 years is now a privateer. There are no rides for the #51 after a few off years of injuries and so-so results so he got some Hondas and is going the privateer route. Well, as much of a privateer as someone getting over a million bucks for wearing his gear at the races can be. 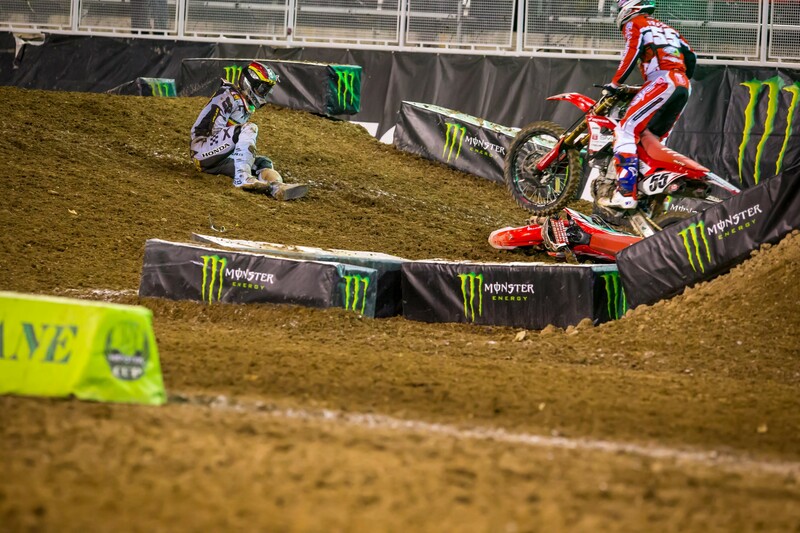 Barcia had a pretty big get-off on press day when he high-sided leaving the steel grating off the start. That couldn’t have felt good on the ego. Anyway, the three main events weren’t spectacular for Justin but he got better in each one as his starts got better. I wouldn’t say he knocked it out of the park on the Honda as a privateer but I also wouldn’t say he sucked either. Word has it that Yamaha has approached him to fill-in for Davi Millsaps on the factory bike for supercross. We’ll see what he does. I was surprised that Yamaha, a brand Justin rode for at JGR and one he has not talked fondly about in the past, would approach him, but desperate times call for desperate measures I suppose. If I’m Justin, I know this year is so important for me and I have plenty of money in the bank to fund this privateer Honda effort, so I would just stay on whatever bike I think can give me the best results. So, are you keeping track of the things I was excited about for the MEC? Gajser? Crashed out. Tomac? Crashed out. Barcia? Just eeehhh. I don’t know, maybe the moto gods weren’t happy with me for my hometown race. After that, well, there was a good slam-a-lot battle with—who else?—Vince Friese and Christian Craig that left Craig on the ground near the end of main #1 and then both of them on the ground for main event #2 when CC tried for some revenge. When it came time for main #3 there was Vince on the line, finishing a credible ninth overall and taking home 6K while Craig DNS with a hand injury. When are these riders going to learn that Vince is not human, he’s some sort of Franken-Vince where you can’t kill him? He’s gotten punched in the head 100 times by Peick, had haymakers rained down on him by Jason Anderson, Kevin Windham put him down at this race a few years ago, and now Craig tried to take him down. It ACTUALLY worked, but of course Christian is the only one that gets hurt. Just STOP IT, riders. Take the punishment that Franken-Vince dishes out and move along. You’re powerless to stop him. Tyler Bowers and Benny Bloss had a nice ram-a-thon (different from a slam-a-lot) going on with Bloss getting the upper hand. After the finish Bowers rode right up to Bloss and I was wondering if there was going to be fireworks. Nope, Bloss said that he was a tad worried but The Bear just told him all that brake checking and ramming was awesome and good work. That’s so arenacross of the The Bear, it’s not even funny. Bloss rode well by the way. He has four 450SX races to his credit but this was definitely one where he shined. He’s riding 450SX full-time in 2018 and could be a sleeper dude in the results. He’s a big guy, he’s got some talent, and I could see him doing some damage. Stay tuned. The amateur classes? They’re just whatever to me. All I can see out there are piles of industry cash riding small bikes over a bunch of mounds of dirt while really good riders, riders that have actually proved they can get good results in actual pro races, struggle to make money. Yes, I’m generalizing here but I don’t care. It’s my column. Anyway, I was talking to Team Green manager Ryan Holliday on the Pulpmx Show, he was saying that Seth Hammaker who won the Amateur All-Stars class, texted him for all the numbers of the Team Green technicians to thank them after the race and also that Ryan mostly deals with Seth and not his parents. There are so many stories of crazy parents in amateur racing and so many stories of families going all in on junior’s moto dreams that honestly, I just want to stay out of it because it makes me shake my head. But this Hammaker kid, I might just have to start taking an interest in him after listening to Holliday talk about him. Stay tuned to see if I show up at Loretta’s this year with a bunch of canned hams pinned to my shirt in support of Seth. Ok, that’s all I gots for this week. Look, the MEC wasn’t great this year but that’s not the race’s fault—it’s not you, it’s me I guess. Email me at [email protected] if you want to chat about this or anything else.